You are here: Home / EVENTS / Remember – Mother's Day is Coming! Remember – Mother's Day is Coming! Make plans for Mother’s Day Tea on the Venosta! 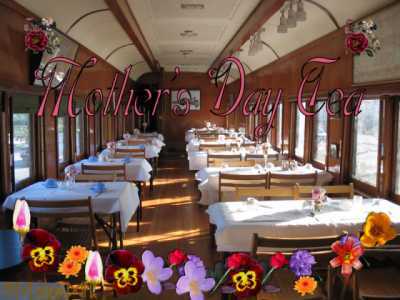 Enjoy tea and treats on the Venosta, a 1921 renovated dining car. Entertainment and a special treat for mom. $5.00 per person, $3.00 for children 2-10 years of age.